These wings were so flavourful and had a nice kick to them, but not super spicy. This is a great way to get a chicken wing fix without the breading, deep frying and a high sugar sauce. This might just be the best wing sauce I've ever had! We had a side of oven baked basmati rice and, of course, celery and carrot sticks with blue cheese dressing (I highly recommend Renee's). This recipe came from paleoleap.com, but I adjusted it slightly by reducing the sauce. You can use this sauce on grilled or baked boneless skinless chicken breasts too if you want to reduce the calories per serving. Preheat oven to 425°F. Line two baking sheets with aluminum foil and grease with canola oil. Arrange chicken wings evenly on the baking sheets. 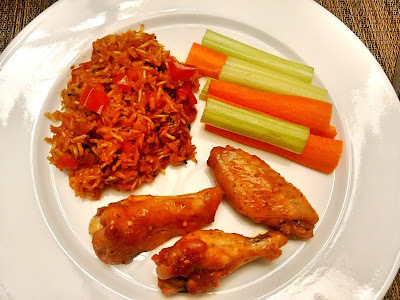 Bake for approximately 30 to 35 minutes, until browned (flip chicken wings over at the 20 minute mark). While chicken is in the oven, combine Frank's Red Hot, maple syrup, butter, garlic and black pepper in a small saucepan and set over medium heat. Stir frequently, bringing the sauce to a boil. Reduce heat to a simmer and continue stirring for 2 to 3 more minutes. Remove from heat and allow to cool slightly. Add the lime zest and squeeze in the lime juice and stir. Remove chicken wings from oven, then place them into a large mixing bowl. Pour the sauce over the wings and toss to coat before serving.